Rob Smith was among the goal scorers as Dewsbury Rangers defeated Thornesians 4-0 as they secured a sixth win in their last seven matches in Yorkshire Amateur League Division One. Picture: Steve Riding. 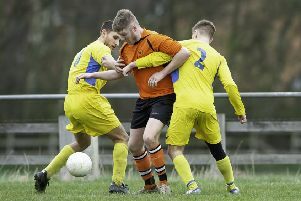 Savile United maintained their hopes of a Yorkshire Amateur League double as they defeated Rothwell Juniors 3-1 in the Hodgson Cup third round last Saturday. Savile are top of Division Five and marched into the cup semi-finals as first half goals from Daanyaal Pandor and Mohammad Kadia saw them lead 2-0 at the interval. Substitute Isan Safeer extended United’s lead before Rothwell scored a late consolation goal. Norristhorpe Reserves were involved in a cracking Hodgson Cup tie against Gildersome Spurs Reserves but they were edged out 1-0. A fierce wind didn’t prevent the sides serving up a terrific contest. Gildersome dominated the first half playing with the wind advantage and they led when a bouncing ball dropped kindly for Ben Barstow and he shot over the goalkeeper from the edge of the area. Both teams created further chances but it remained 1-0 at half-time. Norristhorpe took control after the break, with man-of-the-match Liam Wright in fine form, but Gildersome held on to book their semi-final spot. Dewsbury Rangers bounced back from a rare defeat to register a sixth win in their last seven matches in Division One. They led Thornesians 2-0 inside 15 minutes after goals from Aaron Wroe and Rob Smith with substitute Connor Langford adding a third before half-time. Darren Dewick completed the 4-0 victory with a 55th minute goal. Littletown produced their best performance of the season to pick up only their second win in Division Two as they defeated Horsforth St Margarets Reserves 4-2. Curtis McMahon, Lee Ryan and substitute Morgan East were among the Littletown goal scorers, with Horsforth replying through Josh Broadley and Sean Doherty. Goalkeeper Shane Callaghan ensured Littletown completed victory when he saved a penalty. Dewsbury Rangers Reserves earned their second win in Division Four as they defeated Thornesians Reserves 3-1. The sides were level 1-1 at half-time, with Jake Peace netting after 30 minutes for Rangers. Substitute Alex Peace gave Rangers a 50th minute lead and victory was completed with Liam Smith’s 71st minute goal. Old Batelians saw their Division Five title hopes dealt a blow as they suffered a 3-0 defeat at Middleton Park Under-21s. It was Batelians third defeat of the season and although they remain second in the table, pressure building up from the teams below them, while they also failed to take advantage of leaders Savile United being in cup action. Savile remain a point clear at the top of the table and have two games in hand on Batelians, with Tyersal Reserves just two points behind them in third. Middletown earned victory thanks to goals from Warren Moore and Brad Noble (two), with Ben Abbott their man-of-the-match. West End Park defeated Leeds City fourths 5-1 having led 3-0 at half-time. Goals for Lawrence Balmforth, Danny Clegg, Lyndon Wells, Mylo Hooley and Matt Knight secured a fine West End victory.